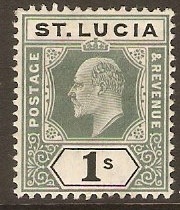 Home :: St Lucia :: St. Lucia 1901-1910 :: St Lucia 1904 5s Green and red on yellow. SG77. 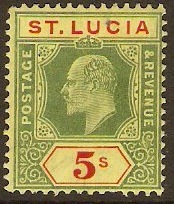 St Lucia 1904 5s Green and red on yellow. SG77. Unmounted mint 1904 5s Green and red on yellow. SG77. King Edward VII definitive stamp. Simply enter your details below and we will send you an e-mail when “St Lucia 1904 5s Green and red on yellow. SG77.” is back in stock!